You know how here in the drought we’re supposed to catch the water in a big dyepot while we’re waiting for the shower to warm up? When you’re in a rush to get ready for church and you’re trying to feel prepared to give a talk, certain people might find it counterproductive to drop their good size 13 black shoe in that pot that got set not quite far enough aside afterwards. Just saying. As we were pulling into the parking lot, Richard happened to say that the best talks he’d ever given were the ones where he’d prepared it and then had just winged it with what it felt like he should say. Because I was saying I’d written a good talk but it just wasn’t quite…something. It was a perfectly good talk and I didn’t want to admit to myself after all that work and this close to standing up that it felt like I might be disappointed if that’s all I gave. And in the moment of truth when I was at that podium I did what he’d done and was glad for that conversation. I said I’d prepared what I’d thought I was going to say–and I was chucking it. I set my sheets of paper to the side there. And then I spoke straight from the heart. I knew a few people there had already heard bits and pieces of this and that but here was the whole of it in one piece. I mentioned a woman I’d never seen before who was clearly badly struggling with–something that day, and I took a leap and said what turned out to be just the right thing for her. Someone had seen. And in that moment we were strangers no more and I saw the burden visibly lift from her. I knew no details, just that she had found what she’d needed in that moment. We have to be willing to be present for each other and the smallest interactions matter so much. I talked of my faults. I said, I was asked to speak on reverence within this Sacrament meeting and yet I’m the disruptive one, I’m the one who gets up and moves away if someone sits down coughing near me. I talked about why. I said, But there is no place for me being grumpy or growly when someone does. None. And I have been, and I apologize for that. We all come here to find peace, not just me. We are here to serve God by loving one another. That only is what we should bring here (or anywhere else). Full stop. I talked about the first, and then the second big Crohn’s flare, where my immediate reaction to it was, but, but, I don’t need another experience like this to teach me to be a nice person–I think I did a pretty good job of learning a lot the last time around. Do I have to go through this? I don’t want to! All I had was who I was. Okay. I decided to pray for each person who entered my hospital room after that. I wanted them to feel their work had meaning and they were valued for who they were as well as for what they did. I figured if I could drop that pebble in their ponds the ripples would go outward to countless patients after me, remembering Dr. Rachel Remen’s books in which she said there’s a certain kind of immortality in acts of kindness. I said to the ward, You can’t pray, really pray for someone without coming to love them. And thus one Stanford doctor came to confess one day that he’d written in my chart, Patient looks deceptively well. Do not be deceived. Because you aren’t supposed to be that cheerful when you’re that sick. Love strengthened life and I was still here. He had wondered. And now he knew. And he knew his own caring had made a difference. So: do I tell you that I’m to be one of the main speakers at church tomorrow or wait till afterwards to rat myself out? Because, y’know, no pressure and all that. “We’re going to have to have a do-over on dinner,” as I came back in from mulching some more fruit trees. Say what? He looked up, questioning. I had only ever seen sprawling plants and flowers and somehow I had missed that the sugar snap peas were not only there but needed to be picked, like, now. So at 8:30, nine of them got stir-fried and I probably should have picked the smallest ones too but I was trying not to be greedy. I’d bought a packet of seeds to maybe do nothing with; a half dozen went into the dirt below the cherry tree to catch any runoff and try to make it useful rather than just having the water go to the prickly plants with the tall flower stalks that I’m forever thinking of simply ripping out and being done with. I didn’t plant more peas because I didn’t want to commit to having to water them for their own sake. They did grow, though, even when the ground was cracked and dry-looking, hidden well enough that you had to look for them to find them, and eventually the pea tendrils tried to grab onto those stalks that blocked a lot of their sunlight–but mostly the plants just flopped around on the ground. I figured they were putting nitrogen in the soil for next year’s tomatoes and that that was reason enough for them. I saw a squirrel nosing around back there yesterday and thought, well, if there was anything there there isn’t now. Today, marveling: How did it not devour these? I dunno, but we sure did! Almost went to knit night. But when it came down to it my voice was hoarse, I just wasn’t sure I was completely past sharing my germs, and I knew at least one person there very much needs not to be exposed. I need some time around knitting people after missing so many Thursday nights in a row but that’s not their problem. So I mulched the Stella cherry instead. And added more grape Koolaid to the tomato plants, happily noting and dousing a new cluster of fruit. I haven’t managed to assemble the large Gardman cage to protect them yet and I know from experience that the critters take tomatoes the moment they appear–like they did the first to set on those plants. Which I then doused with that unsweetened grape flavor and they don’t seem to have been touched since. And yet it’s only the birds that are known to be affected by the stuff. Hey, whatever works. I’d been curious for awhile and I happened to look at 9:30 this morning, so I set the timer on my phone to go off at half past each hour all day to remind me to check and write it down: what was our UV rating now? I wanted to know the arc of the sun in real time in terms of my lupus. The 11 rating out of a possible 12, the highest of today, was at 1:30 and 2:30. Who knew noon was safer? Richard got home from work to find me on the phone with my childhood friend Karen. Michelle had stopped by and joined in for awhile, now it was his turn. It was great. She so belongs to us all. I’m not a big phone person and he knew it and he knew it had been a long time since we’d chatted and here we were. Near 8 pm our time we and she finally, reluctantly let each other go. We ate a three-minute Trader Joe’s meal with fruit on the side–dinnertime and all that, we were famished, the last slice of homemade berry pie divvied up to top it off. And then he went to pick up the phone. I’d silenced that alarm three times. Maybe four, but I think three. Wasn’t paying attention to any sense of time (and that phone was a surprise several times), just one of belonging. The contractor did damage to the aging roof and we ended up with seventeen buckets catching the incessant water leaking inside. It rained so much that winter that a beam he’d had waiting in the yard for a few days warped enough to soon crack the new window set against it–so that had to be replaced. We named the inside downpour roof juice and joked that if the legislature should ever again need to end a drought, all they had to do was re-remodel this place for us. And then it turned dry again. So we’ve been pretty good at not wasting water for a very long time now. The San Francisco Bay Area, for whatever reason, has been better at water conservation than the whole rest of the state and is under slightly less drastic cutbacks. My one fault was frequent laundry loads, because having gone through that one good-sized earthquake I just really don’t want anyone to be out of underwear when the next one hits. Relandscaping this past year, though, with the extra water that new trees need and with sixteen fruit trees–when they said cutbacks were going to be mandatory, I thought we were totally hosed. So I bought us more underwear. More favorite-color-blue oxford shirts for him. Bigger laundry loads done less frequently, well okay, and I have thrown some loads together that my momma taught me not to mix, but, drought, so, yeah. Not because we wanted to, but, we bought a much more water-efficient dishwasher. We replaced that outside faucet at last, and although that wouldn’t show up in the bill yet, that will make a difference, too. And tonight, with Richard’s back giving him grief, I unloaded four monster bags of mulch from the car. I just went to pay the utility bill and just kind of stared at it a moment. There’s a line where you can compare how much you’re using to how much you used in the same time period last year. It doesn’t show you two years ago, and that’s the number the state is comparing against, but it still definitely gives us an idea. Our city is under a mandatory 24% water reduction starting June 1. I was sure any laundry savings was being offset by my trees. I had to do the math to make sure we hadn’t already hit that target. We are so very very close that replacing that tap was all we needed and laying down that mulch will top it off. Gee, maybe I could have planted that pomegranate I wanted after all. Hey, Jerry Brown, maybe just painting the outside and redoing the driveway would be enough this time? Every bit of green on this tree is an act of triumph. We bought this English Morello tart cherry tree on March 14. Bare root season was pretty much over but over there on the cool coast of Santa Cruz the tree was still dormant (and cheap!) It was the variety I wanted. We planted it. And then we waited and waited and waited. Given that it’s the one we expect to grow to block the view from our windows to our neighbors’, having it just sit there mutely gray was not in the plan. It was even on standard rootstock, no dwarfing–that way it would take off faster, like the Indian Free peach has, even if it meant it would take more pruning effort later. The fig tree we bought at the same time has leafed out nicely with new branches starting, doing what the newly planted do. It has clearly recovered from all the cutting I had to do to its roots to separate them from each other. Eventually I was clearing away spurts at the ground from the cherry’s rootstock–that is so not the variety I want to grow. And then at long, long last we got just the beginning hints of green up above where there should be. Yet I never saw anything touch it and the other trees were doing just fine. Finally one night when it had started a flush of green yet again I went out there with a flashlight and my stars: the whole thing was a completely solid mass of black beetles stripping every bit of leaf straight down to nothing. They weren’t touching the ones from the impatient rootstock that wanted to get on with this living business, just the English Morello part. I did what I could to clear them off, feeling just sick. Grape Koolaid anyone? And then we went off for four days for the weddings. Our friends Krys and her husband were at the second wedding we went to almost straight from the airport. And they wanted to know: had it worked? I had forgotten all about it. Back when I was fighting an ant invasion in the garden I’d read something about how the barbecued ash from charcoal briquets breaks ants’ joints and kills them and our friends had shown up at our doorstep with what they’d cleaned out of their grill for us. It had worked; the ants were gone. Wonderful! And then I had utterly forgotten all about it. So there we were talking and they were saying, We bet we gave you a lifetime supply of that stuff. How was it? Oh, you bet it worked! Thank you so much and you can clean your grill any time, I’ll take it! As the obvious hit me upside the head–Duh! I had had it right there! We got home very late. There were the very barest slivers of maybe two leaves left, and I doused them and the whole tree with that ash. The next night I looked again and still found two beetles; one disappeared fast, the other reared up on its hind legs as I let it have it, then fell off. But over the next few days the tips of what was left (meaning, pretty much everything) shriveled and turned black. I didn’t know if it was from the ash or a disease from having been bitten. I went to cover the mango that night and suddenly realized I had a second cover on hand. How about a physical barrier for the night bugs? And that, that, is how, on Memorial Day, our cherry tree is finally beginning to look like it’s early March. It’s still got a few bites but it was so very close to dying on us and now, now, it’s going to be okay. That picture is a week and a half’s worth of growth and it definitely has some catching up to do, but now we know it will. It had just needed the right treatment. The knitting grabbed me and it wouldn’t let me go. It’s been awhile since I’ve kept going until I had to stop to ice my hands. It felt good to get something accomplished. Except now, if I end up waiting in the doctor’s office and then again for chest x-rays tomorrow–we’ll see what the morning brings, not sure yet whether to make an appointment–I’ll actually have to plan a new project and bring the yarn to start it, because this one’s going to be finished pretty soon. Which is a good problem to have. Richard ran All The Errands for me. I tell ya, I got me a good one and I know how lucky I am. 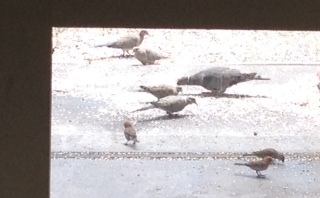 A band-tail pigeon a few days ago, briefly away from its flock, dwarfing the mourning doves . I saw a spotted towhee today, all dressed up and ready to go. Still not up to getting much done (I tried not to breathe on the plumber yesterday) but the fever part seems over. I knitted for the first time since this started and it felt like a coming home. Walked around the yard near dusk and breathed in all that growing life. The sweet pea seeds I pushed into the dirt just downstream from the cherry tree in hopes that something more useful than weeds might take up the overflow? Other than an occasional handheld gallon out of guilt, I totally left them on their own. Bad gardener. They’re blooming. Not a bite nor blemish on them anywhere. Jess the plumber came and I have a new toy. It doesn’t leak. You turn it a quarter turn to get full volume. It’s ready to take care of my fruit trees. The original plumber had not only used a substandard part, he had welded it on so that it couldn’t be replaced without having to pay someone to cut the metal pipe and start over; now though, and Jess showed me, all you’ll have to do if/when we need to is just unscrew this and screw on another. Done. I told him a little about the guy who’d installed the earlier one, trying to explain how we’d come to have such a mess there. The man had also installed not-up-to-code gas and water lines across our roof that had all had to be replaced and should have been caught by the inspector. He’d tripped over and broken another subcontractor’s lamp as its owner watched–okay, things happen–but instead of apologizing, he had defiantly said he’d done no such thing. And he’d stolen our bicycle tools. YES. Yes exactly. We can buy new tools and pipes. He can’t steal his way to feeling good about himself. And I liked Jess on the spot. And I thought, and sometimes you have to luck out. Which I did this time. But he was particularly taken by the Yellow Transparent apple. Look how it had grown back! He told me it had lived by love. He told me I’d loved it. I hoped I deserved that compliment–I do love it now but honestly, it took me a few years. First I had to know it better, and a huge thank you to my sister for explaining spring apples to me, much less Yellow Transparents, when I’d never heard of them and couldn’t figure out why by fall the thing was always a total loss. It fruits like crazy and its branches are particularly laden this year, to the point I need twice as many clamshells as I have. And then he told me a little of his own story. He’d been in an accident when he was a kid: he wasn’t supposed to walk again, he wasn’t supposed to talk again. His speech was slightly slurred but I thought, given that history, I’d take slurred, definitely. And in the long recovery he’d had to go through everything had all come down to love. Love is survival. Love governs everything, every waking moment, it IS the awakening and the everything. I recognized that. I’ve been at that edge of life, I know… But he’s never lost sight of it. His very speech reminds him, and he is grateful. And that apple tree–it just so captured it all for him. It made him so happy. At the last, he motioned to the big dyepot that had been catching the drips. At about 35 pounds, I admitted I’d hurt my back emptying it the night before, which is why I hadn’t moved it more out of his way than I had. And so he reverently poured that life-giving water in a circle around the base of that tree. And it wasn’t till afterwards that I saw how much it had meant to him to be able to take care of it as well as he did of me in the time he was here. Thank you, everybody. Today was definitely better. And… The outside faucet now refuses to turn all the way off. Yow. This is so much not the time to be wasting water— $135 for an hour of a plumber’s time tomorrow will be money well spent, for my sense of guilt as much as avoiding being fined. Meantime, five fire hoses full time, 100 gallons a minute each for eight weeks, the most pristine Yosemite-area water in the state when free recycled water was available right nearby but, y’know, then you’d have to pay the truckers… That link gives a whole new meaning to Candle in the Wind. I can’t fix them (ah, okay, here’s the followup article) but I can fix mine. Overdoing it Saturday caught up with me the last few days. Spent most of today sick in bed. But we did eat the last cherry and it did help. I didn’t take its picture. Bad blogger. Just let me say it was a perfect cherry red with a faint, deeper stripe running down the center: big, plump, a work of art. Note that we had eaten grocery store cherries a few hours earlier. …That would do. Wow. That would definitely do. For three years I’d wondered if I should have bought one of the varieties that had won the taste tests at Dave Wilson rather than the impulse-purchase tree at Costco. Did Costco get the unpopular leftovers? Had I, after all that work and water, deprived us of what we could have had? My thought, too, there was just no comparison. Next year we will definitely do the bird netting, in metal if need be, now that we know what we’ll get so much more of if we do. In great self-restraint I left the other cherry in its clamshell on the tree for tomorrow. We are savoring the anticipation. Still pondering that woman from yesterday. She was–maybe–young enough to be the age of my oldest, and I think that helped my reasonable-Mom reaction snap into gear. Raising four teenagers taught me not to take offense even when it’s intended because it means the kid is hurting badly and needs understanding and not taking it personally. And a firm guideline, definitely. As I think back to a screaming 16-year-old, a soft answer in utter calm and love but utterly to the point, a slammed door, and, after two hours’ self-imposed cooling down, a complete angel reappearing who never kvetched about any of that again. One of my memorable moments of motherhood. Who knew that it would help get me ready for yesterday. I marvel that this woman had happened to knit–and with the weather that had been chilly for May, had happened to choose that day to put on that one–that particular simple but unusual pattern that I could spot from a mile away where you get to the end of your shawl knitting on the diagonal and then drop stitches spaced just so all the way back down to the beginning. Clah-poe-TEE. A French-speaking designer. I marvel at the timing. My unusual arrival time due to the schedule of the day paired with her departure time from Costco: seconds off and the whole thing never would have happened. Frankly, I marvel at what she did, of course, but whyever she did it clearly had nothing at all to do with me. She was reacting to something that I represented to her, whatever it may have been in her history, and her choice of outfit made it so I could offer her an out: anybody who didn’t quite see what had happened could have thought we were just two knitters striking up a quick conversation with an implied compliment. But the experience offered her a choice: if she’s any kind of a good person, then the starkness between her behavior and mine was a heads-up that she needed to confront whatever the source of her angst was that was causing her to lash out at complete strangers and to do better. We’ve all had moments. We’re all human. Sometimes we simply need to see ourselves more clearly to find our way back up when we’re down, hopefully with the support of those around us. She’ll never know it, but I’m rooting for her.